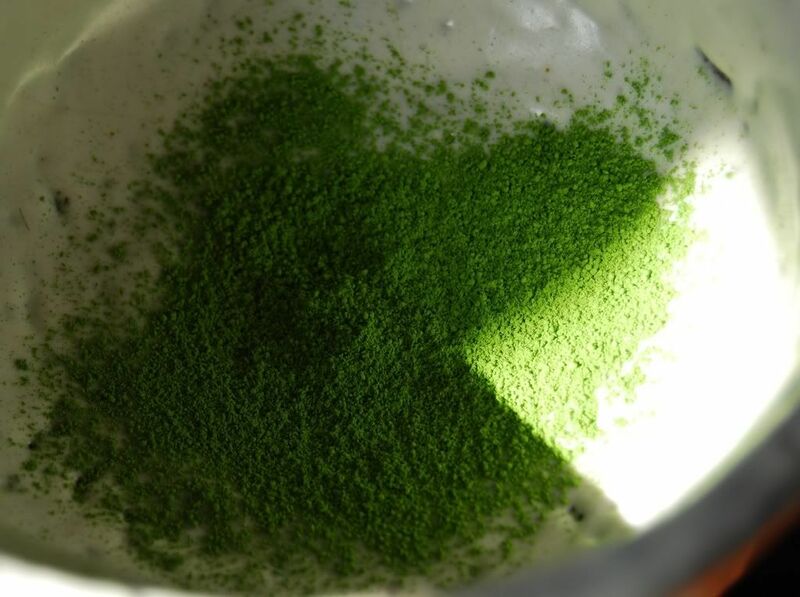 "This is a highly above-average matcha." "Kiku Mukashi" means "chrysanthemum ancient". Something bizarre appears to have happened to me, because I appear to be able to read the (Chinese) characters: juxi. It's green and powdery. 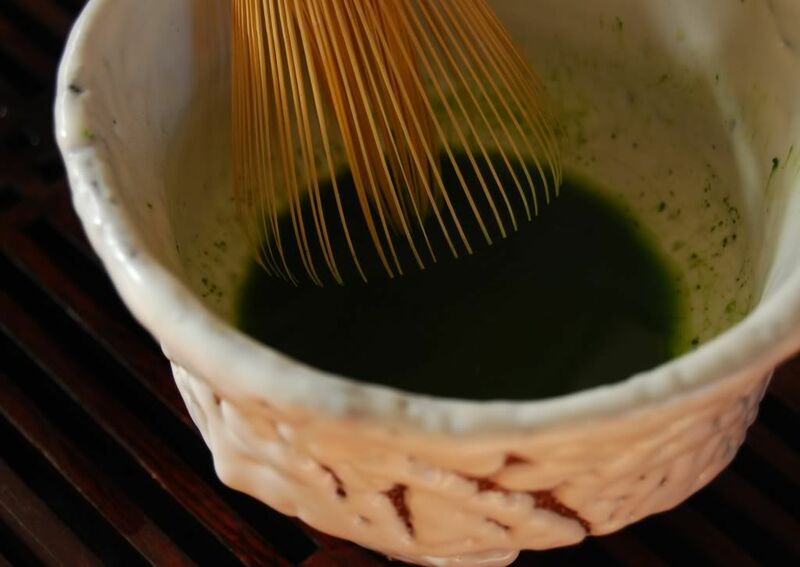 This is an usucha [thin matcha] from Uji. The aroma is, believe or not, quite close to the powdery sweetness of chrysanthemum. We have jars of the little yellow flowers knocking around our house, as Lei likes to mix them in with her various traditional medicinal concoctions. 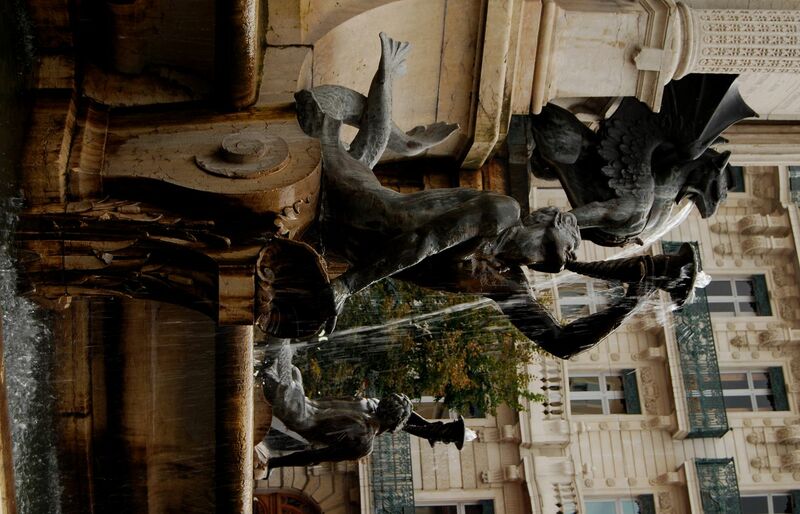 The addition of water brings it all to life. 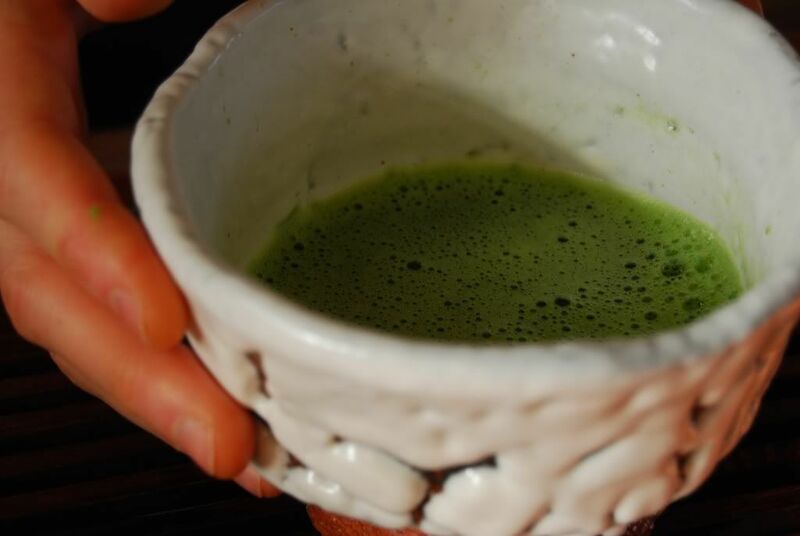 While my skill is just that of a humble neophyte, I do enjoy matcha very much. 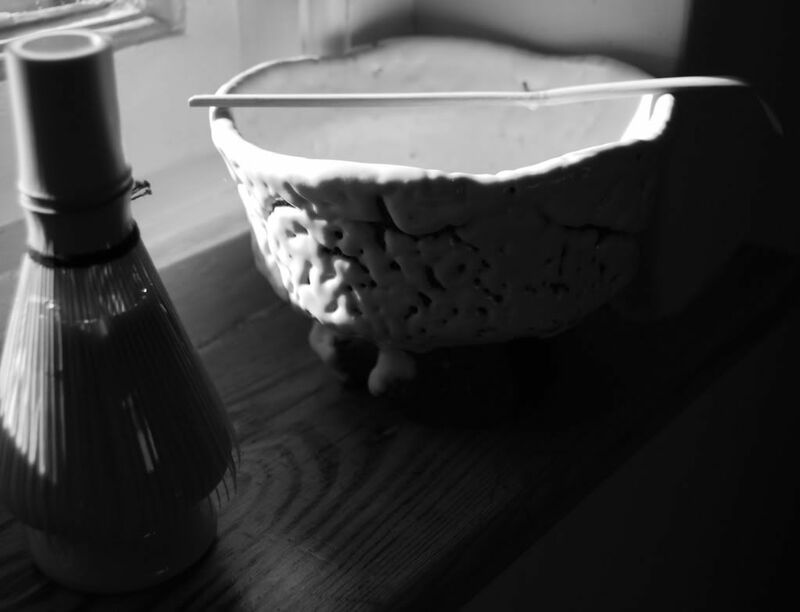 If pressed for time in the morning, a simple bowl is rapid to produce, and is a great opportunity to sit down with Lei before we go our separate ways for the day. It doesn't last too long, and is quite expensive, but you get what you pay for. 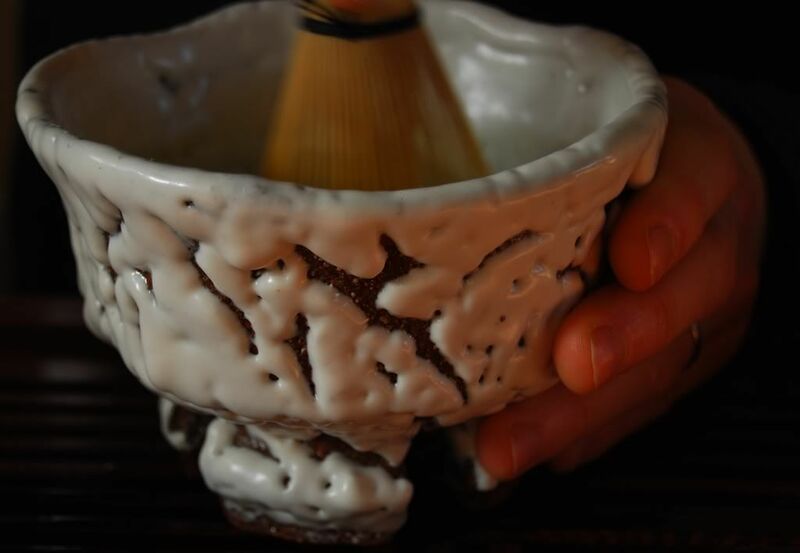 It has a touch of "edge", compared with the super-smooth "Chiyo Mukashi" [Qiandai Xi - Thousand Generations Ancient], although the latter is koicha [thick matcha] and about twice the price. A superb way to the start the day, in moderation. 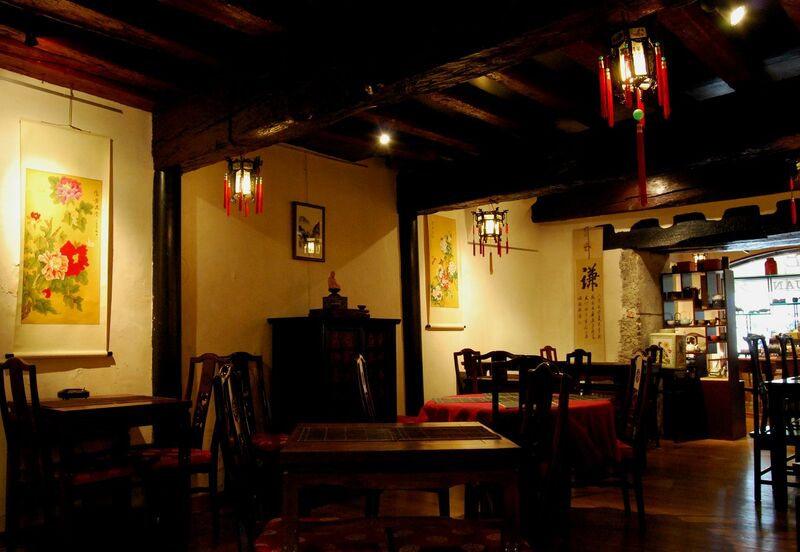 Here, "chunqing" [Choon-ching] means "true feeling". My wife recoils in toe-curling horror at the name, saying that it sounds like something appallingly wet that a teenage girl would say. I'm still chuckling. At $50, it's not inexpensive. 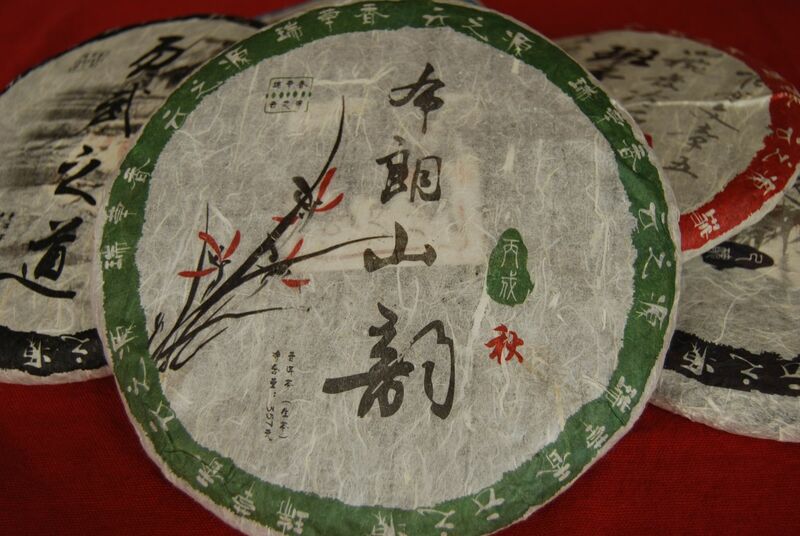 The price of Banzhang maocha is always high (well, the highest, in fact) - but is this good Banzhang? 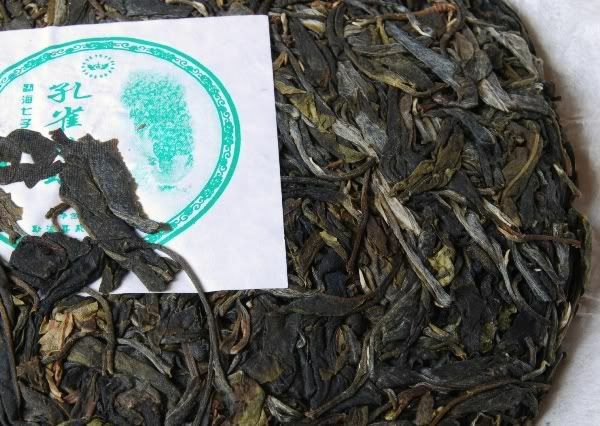 Scott writes that it was selected after testing 15 different maocha, which sounds like a fun time in anyone's estimation. Long leaves, large fragments, lots of tips, stone compression - pictured below. The aroma is a touch hesitant, but then I did try this one immediately after the uber-aromatics of the Guafengzhai. As with all of these teas, excepting the orange Bulangshanyun, the soup is an encouraging yellow. This one has a hint of green about it, as did the Guafengzhai. It is clean and vegetal in flavour, and with a decent aftertaste that swells to make my mouth water. 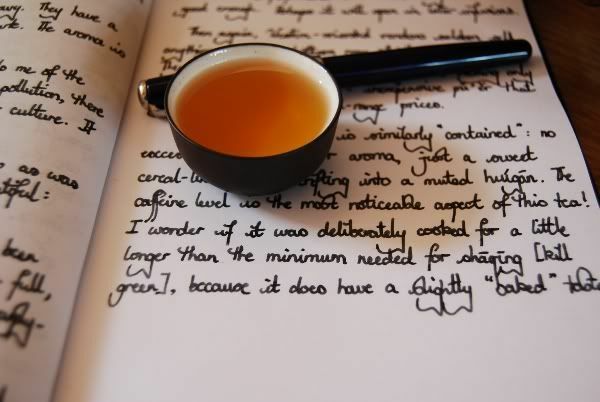 The yunxiang [after-aroma] is a gentle sweet butter. In texture, I quite like its decent thickness and its overall sweetness. 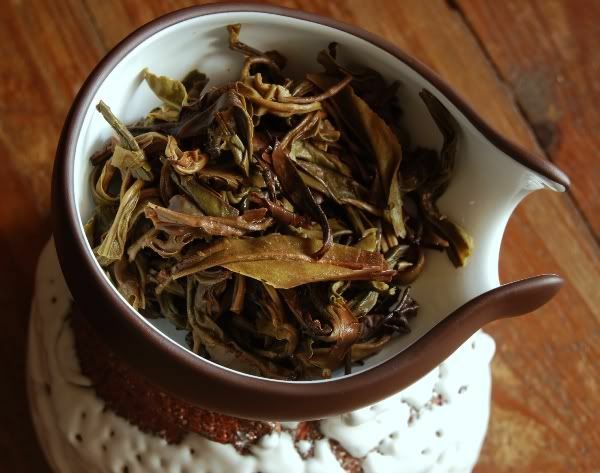 It is clean and decent - while not as complex as some of the qiaomu Laobanzhang maocha that I was fortunate enough to receive from Nada a while ago, it is nonetheless very enjoyable. I couldn't place this as a Banzhang leaf explicitly, but then again, it doesn't taste explicitly unlike Banzhang either. 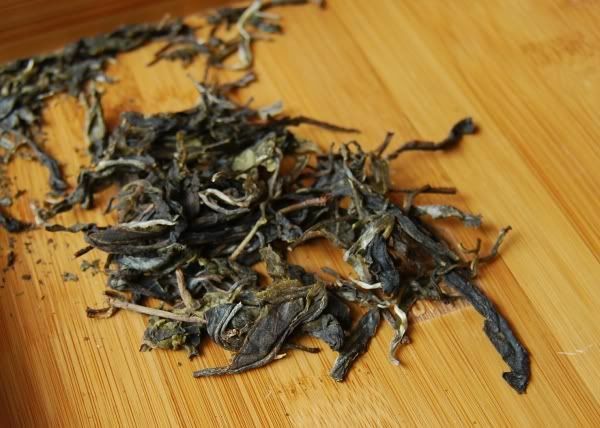 It has no great vibrancy on the tongue, nor the cooling sensation that I've had from Nada's Lao- and Xinbanzhang samples, and these latter are a constant source of comparison for me in trying Banzhang teas. It's a good thing to have reliable benchmarks. Overall, it is soothing and gradual, rather than being instantly energising. Sweet, thick, with that buttery yunxiang, it is enjoyable. Is it $50 enjoyable? Perhaps not, but, then again, it is far better than most of the modern cakes that we see for sale from Western-oriented vendors. 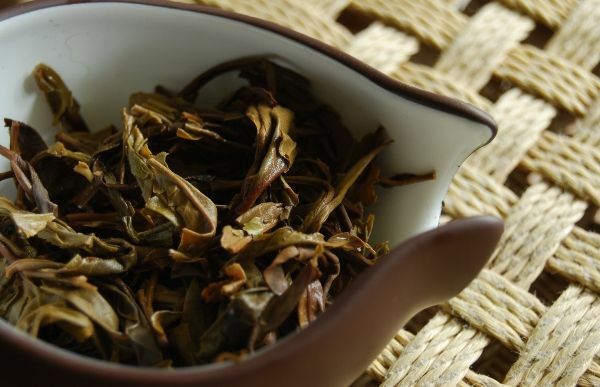 I think that the price reflects the expense associated with Banzhang leaves, rather than the quality of the tea itself, but it is very decent. It is, in my opinion, not able to sit next to the Guafengzhai at $50, for example. With that, let us bid the Yunnan Sourcing tasting event adieu. 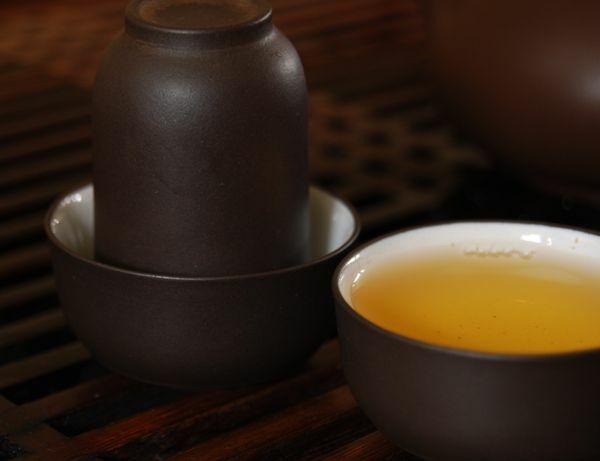 I very much hope that you've enjoyed being along for the ride, and, if you were quick enough off the mark in getting into the event, I hope that you've enjoyed drinking these teas along with Lei and me. Thanks again to all those who have posted their notes while we've been going along. 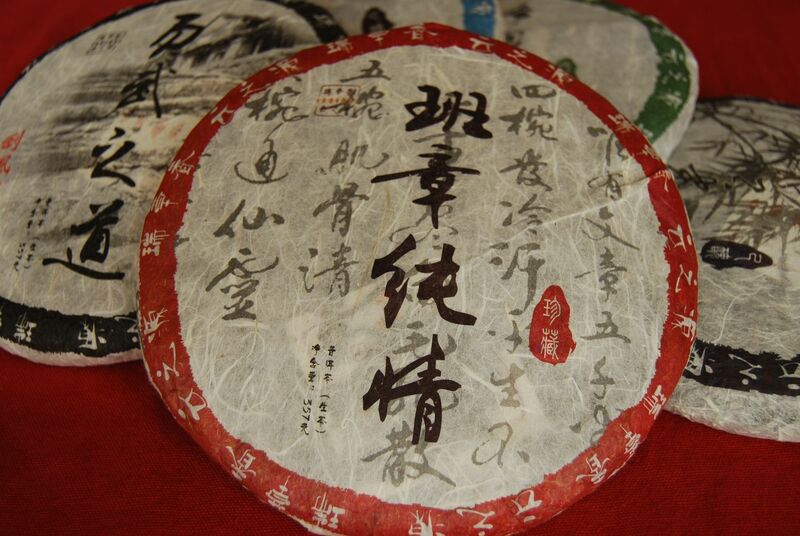 At $20, this "delta" is the most inexpensive cake in the Yunnan Sourcing tea-tasting event. 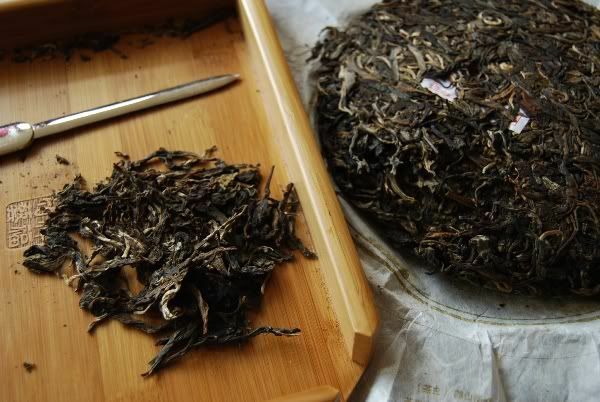 As I'm sure everyone knows, "Lanxiang" [lan-sheeang] means "orchid aroma", and is often used to describe certain floral types of pu'er. 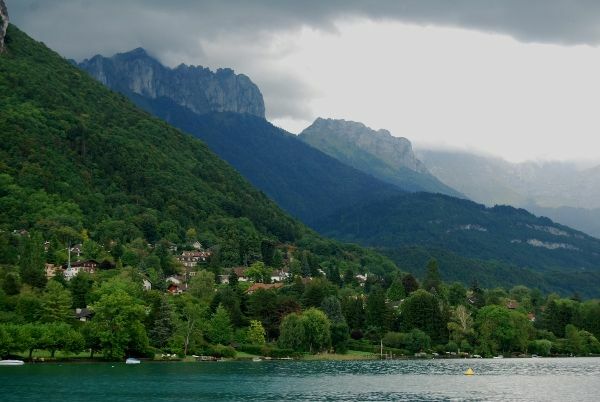 Wuliangshan, at 3300m, is the tallest peak in Simao, and it borders Lincang and Dali (Xiaguan territory). 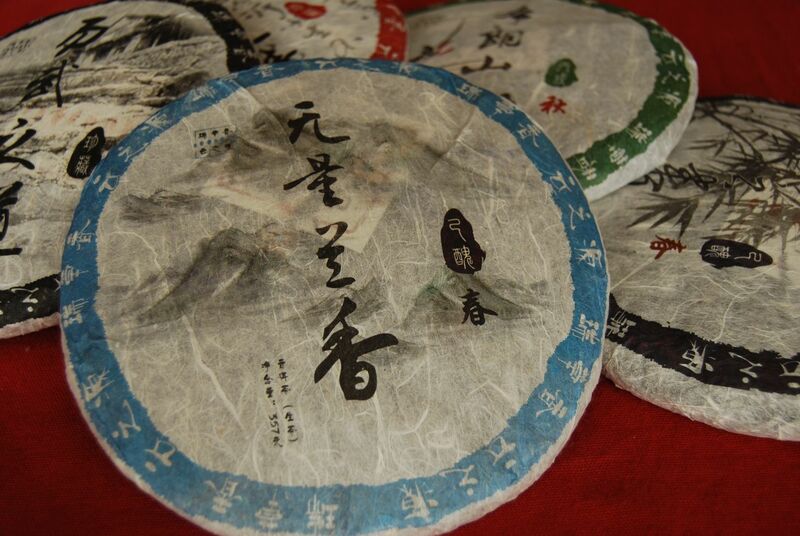 It's a "northern" pu'er, where things can get a bit beanier, a bit more savoury, a bit more "sweet potato". Yunnan Sourcing writes that this is from Zhongcangcun [Djong-Tsang-Tsoon, "Middle Store Village] at 2,300m above sea level, "making it one of the highest-altitude pu'er in existence." 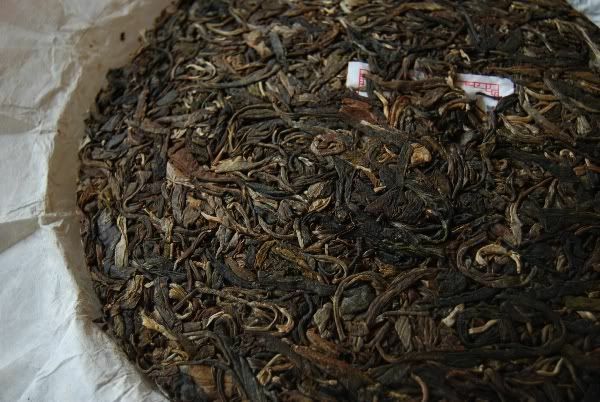 Scott also writes that "the tea gardens are arguably some of the most remote in Yunnan." As pictured above, this cake is made from small leaves. As its name aptly suggests, there is a floral aroma about the dry leaves, which is quite pronounced. 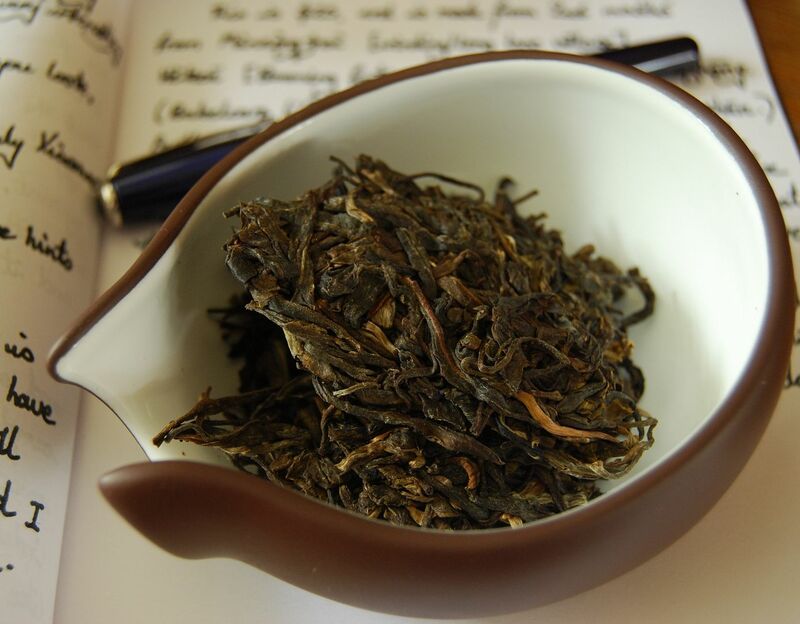 Young pu'er can be so very vivid, which is part of the appeal for me. 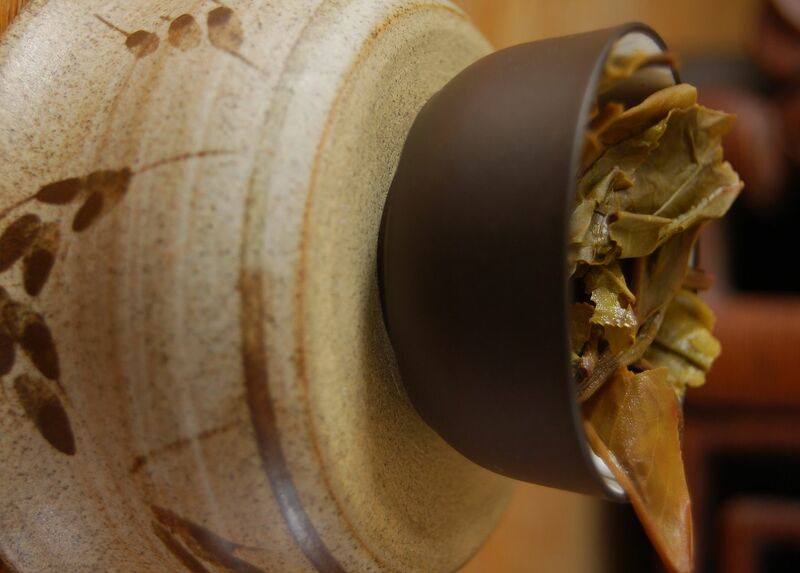 Lei and I found the flavour to be distinctly tangy, being dominated by lower tones of the creamy leather that our tetsubin emphasises. It is crisp and clean, with a decent thickness. A sweet floral character occurs in the nose, which might be "lanxiang", but it occurs concurrently with the creamy finish. It wakes up noticeably by the fifth infusion, where the floral character in the nose becomes more pronounced. The whole feeling is tangy, sweet, and floral, with some low leathery characteristics, and plenty of huigan that makes my mouth water, gripping the side of the tongue as it does. I rather liked this one, and my sorrow at parting with the remainder of my sample was compensated by the eventual arrival of the whole cake. 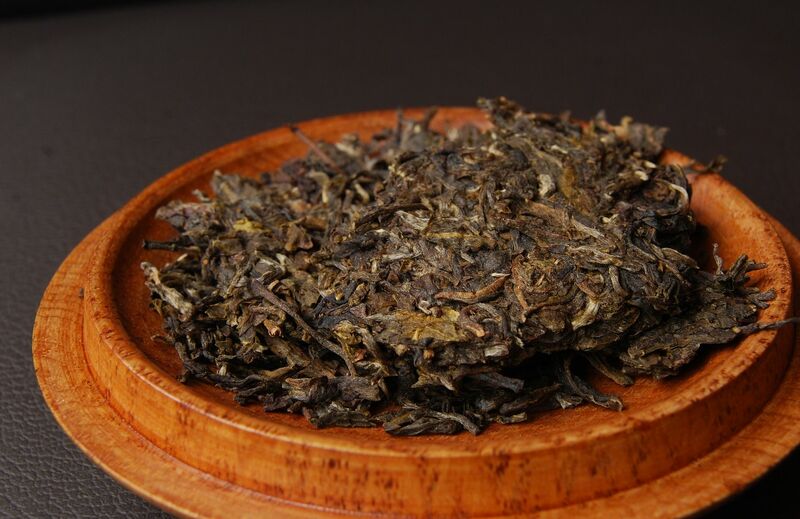 "Gamma" is the "Bulangshanyun", which by coincidence or design is the same name as the dreadful "Bulangshanyun" from Puerh Shop that I lamented a few days ago. 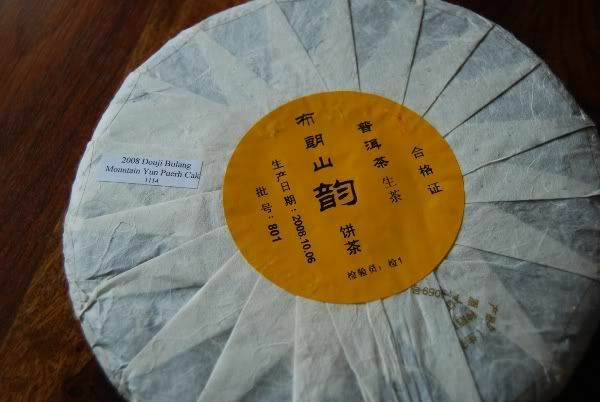 Yunnan Sourcing notes that this cake was made from 2006 maocha from Mannonzhai [winding-lane village], near Hekai, some 20km north of Banzhang. Everyone I've seen so far has putting "gamma" at the end of the list (alpha, beta, delta, epsilon, gamma), but as it is the third letter in the Greek alphabet, I am going to insist upon correctness! Don't say you never learn anything from the Half-Dipper. The leaves look a little older than the other cakes, which were super-fresh 2009 leaves. These Bulang leaves are quiet, a touch mellowed. 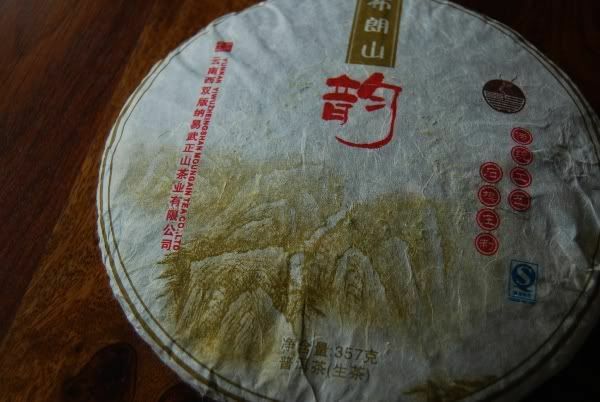 As shown below, the soup is already orange - certainly more orange than aging for three years should provide, and so we suspect some pre-oxidation, wulong-style. 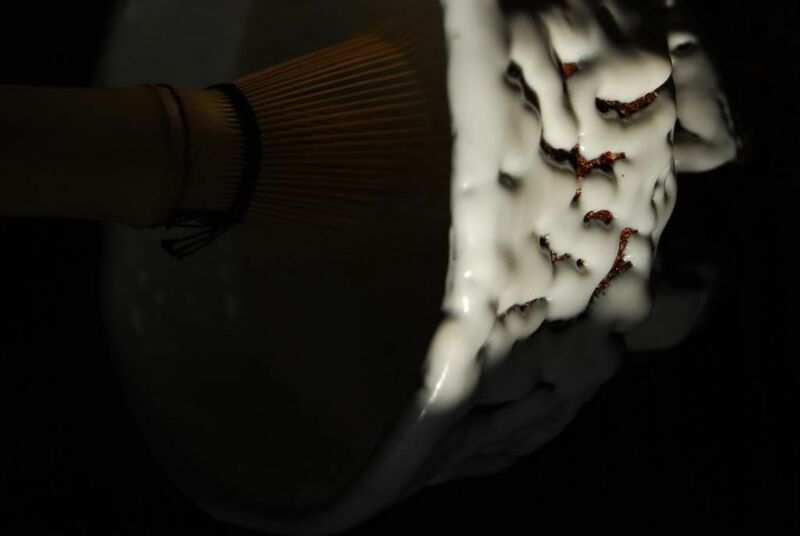 The aroma is largely invisible - there is some tangible compound being emitted, but it has no detectable scent. It is a simple tea, but smooth enough for me on a busy morning. 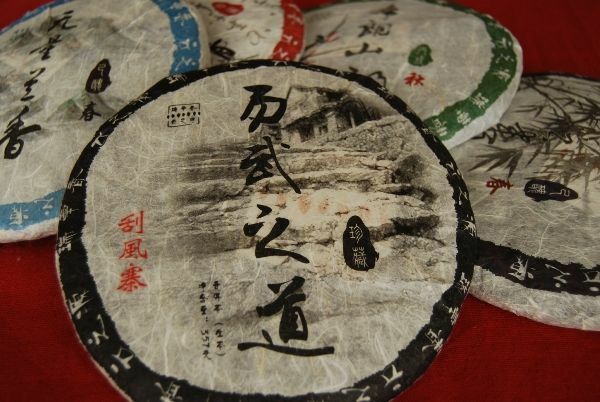 I find that it has a creamy ending in the throat, emphasised by the somewhat creamy water that our tetsubin delivers, and this reminds me of the little 2008 Douji "Dadou" and "Shangdou" bricks, which are almost milky. 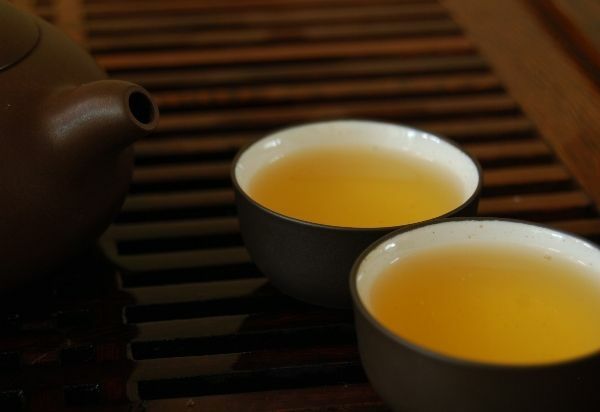 This tea is the second-cheapest in the range of five cakes, at $25. 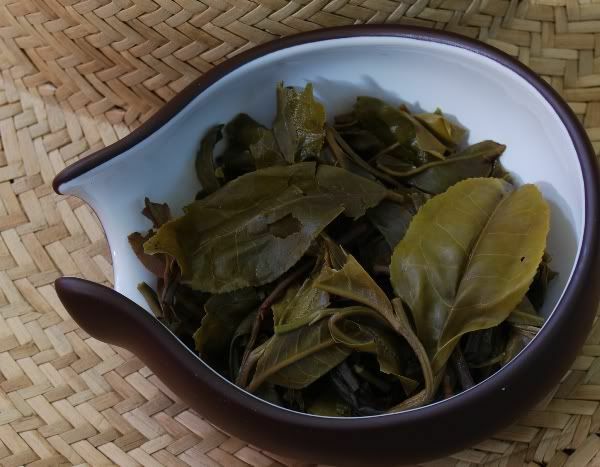 I enjoyed it, but be aware that you're not buying fresh, green shengpu - rather it has been aged in a sub-optimal environment, and possibly processed in an imperfect manner. 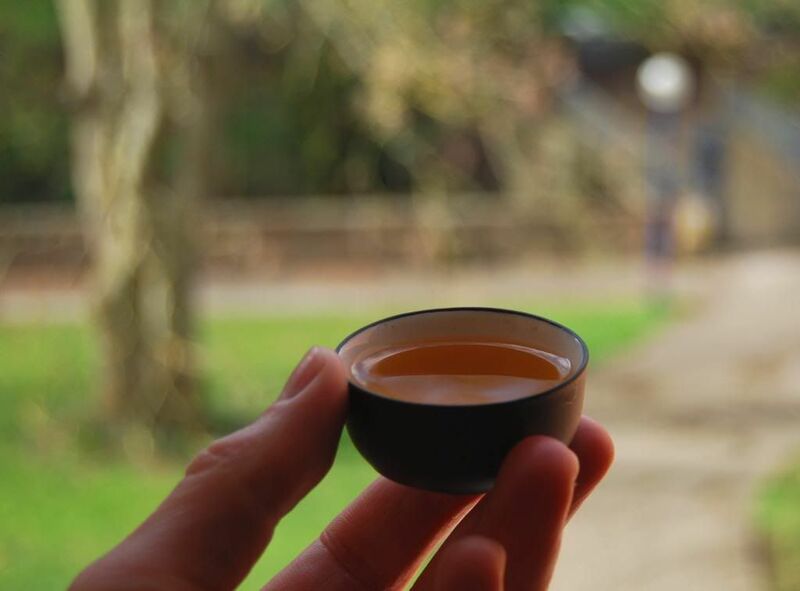 A simple tea, and while I enjoyed it well enough, I would not count it as one of my favourites among the five in the tasting event. Its processing and aging would prevent me from buying it for storage. 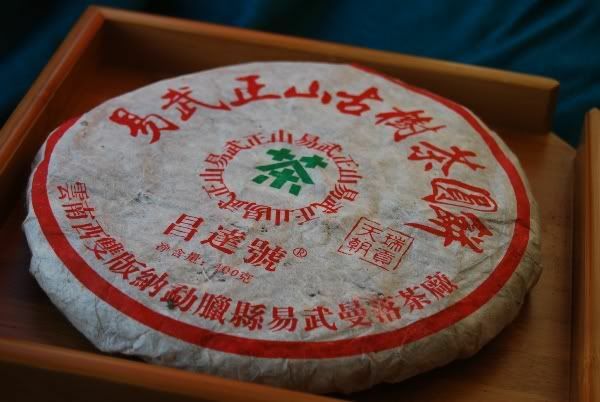 The cake's name means "Spring of Youle", and the product page at Yunnan Sourcing states that the maocha came from Longpa Village [lit. "Dragon Fear"!]. At $32, this cake is less expensive than the $50 Guafengzhai, though the latter was, in my opinion, the star of the show by quite a margin. The medium-large leaves, pictured below, are covered in down, and are already quite dark. 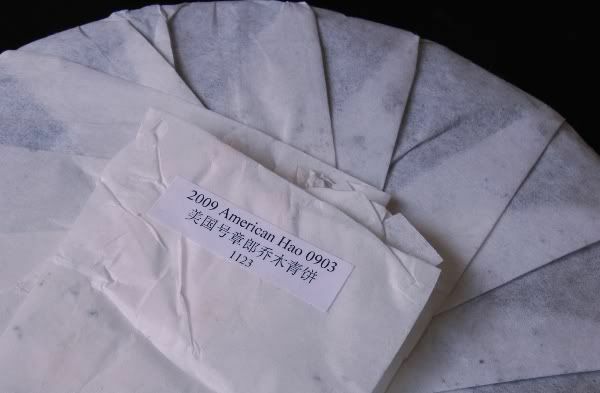 As with all of these super-fresh cakes, the aroma of green shengpu leaps from the foil sample-bag. A heavy fruitiness is buried in that scent. As with the Guanfengzhai, the soup is a straight, encouraging yellow. It has a base of unusual watery sourness, which then ends sweetly - it is an odd combination, but not unpleasant. 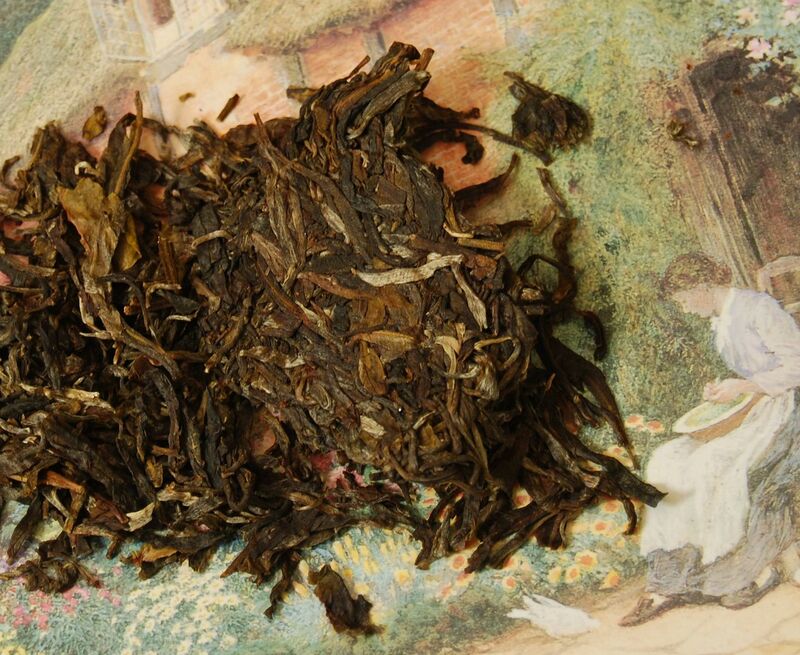 Beneath it all, a low, earthy, "tea"-like flavour, that mixes with the fruitiness and the sweetness. 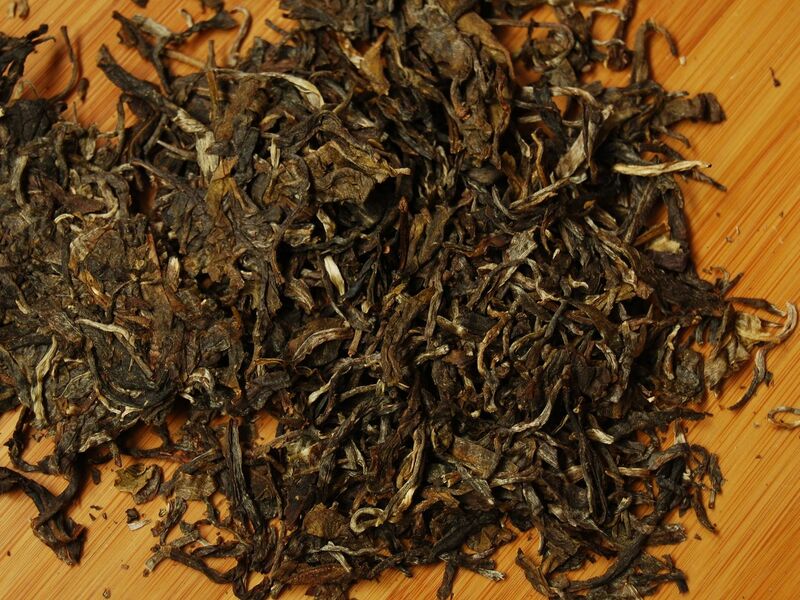 "Lightly roasted, like barley tea", notes Lei, referring to the shaqing stage. "Very gentle." The slightly overcooked sensation is noticeable in the tobacco-esque aftertaste. 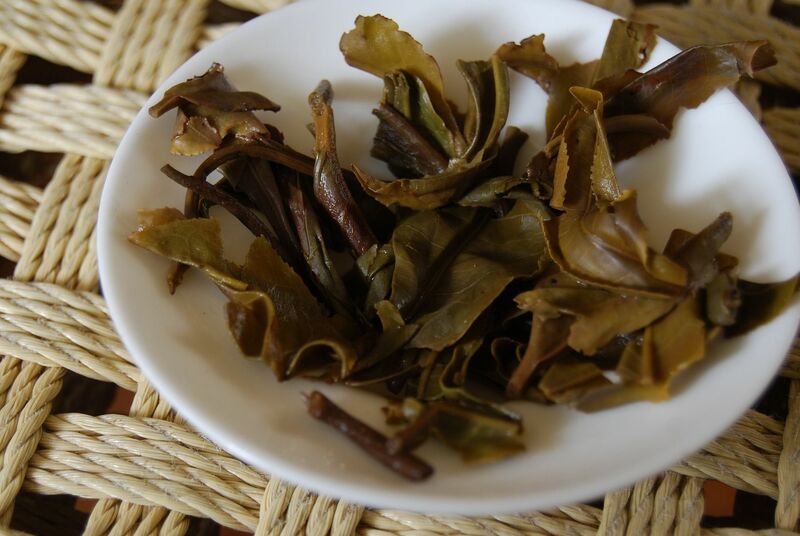 The quality of the original leaves is good, as it does not become at all rough. Over the infusions, the combination of sourness and fruitiness fade into a generic sweetness. Its degradation is graceful. Less impressive than the Guafengzhai, I can't see myself buying more than the single cake of this that I did. 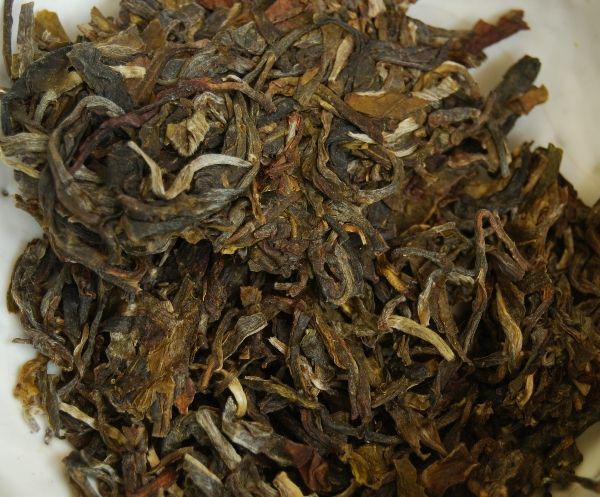 The mixture of leaves shown above indicates that the processing was not even, and $30 is a bit of a stretch for a tea of this quality. Nonetheless, it has an interesting blend of characteristics that eventually settle down into a constantly sweet tea that lasts quite well. This cake should have been called DRAGONFEAR. Such a wasted opportunity. Pictured above, this cake has been residing in my "miscellaneous" stacks since I bought it, in 2009. As shown below, the cake remains untouched. However, much has changed. 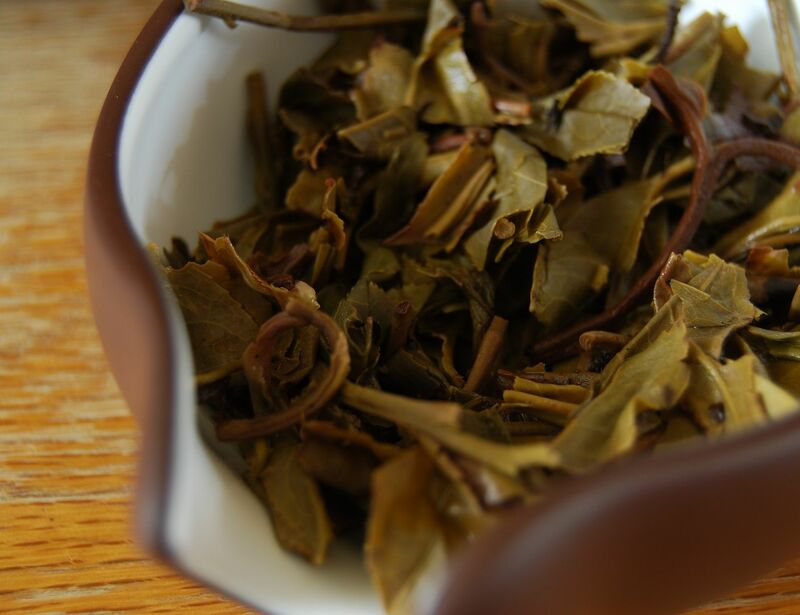 The leaves have the strong scent of deep humidity: sweet, potent, and slightly mineral. While always dark, these leaves have become richer, and a little more brown-hued, as time has passed. 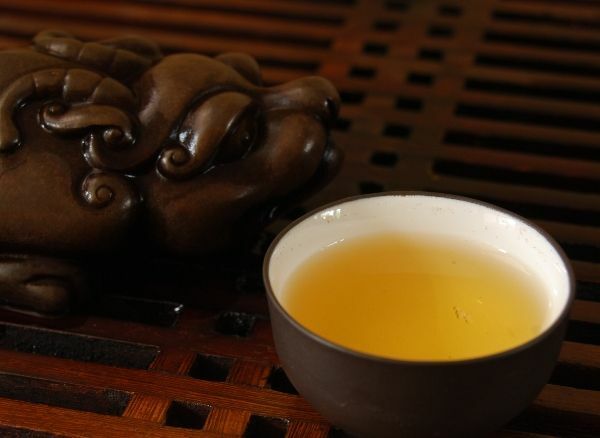 The character in the pinmingbei [tasting cup] is very positive: it is long and sweet, with a rich base of solid "tea" flavour much beloved by fans of Youleshan tea. The sourness that I found in its youth is gone. There is a tangy, sweet-straw finish and a solid cooling sensation. I am rather pleased to have a cake of this - my old notes suggest that I nearly decided not to buy it. 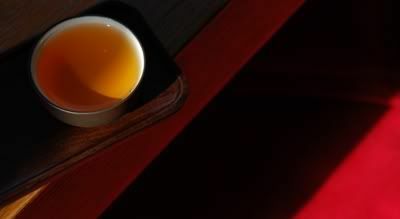 As the infusions pass, the tea settles into a long sweetness, without really fading noticeably until the session closes. What once was sour and strong is now sweet and straw-like. There is scope for further aging, as it remains tangy and punchy, but it was an enjoyable sampling of a cake that is in the middle of its "change". This year, Yunzhiyuan [cloud's source] and Ruicaoxiang [auspicious grass-scent] have created a bunch of cakes from around Yunnan. 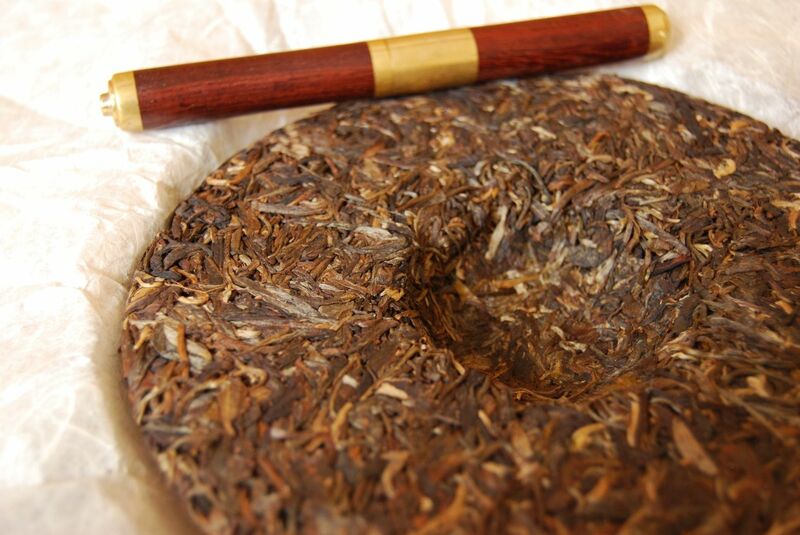 A subset of these are "Yiwu zhi dao" [Yiwu's Road, or "Road to Yiwu" as YS calls them], of which this is the first cake. 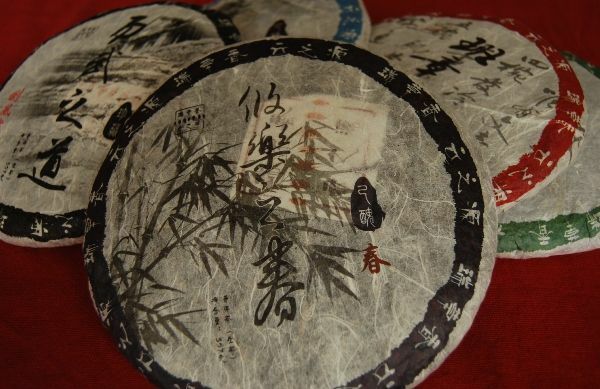 In 2009, many of the large Western vendors (Nadacha, Yunnan Sourcing, Dragon Teahouse, and Puerh Shop) are selling their own pressings. This year is the first that I've ever heard of Guafengzhai, a small village somewhere in the Yiwu border region near Laos. However, I've had two Guafengzhai cakes myself so far this year, and ST appears to have come across a third. 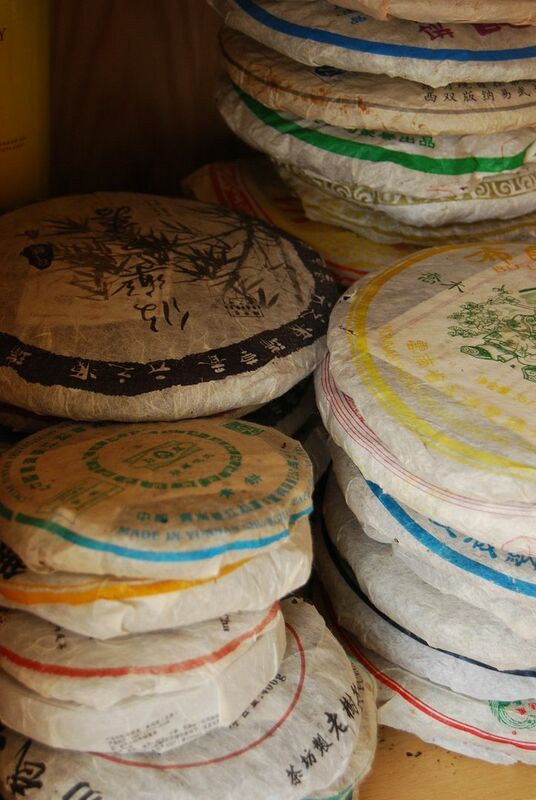 All of these YS cakes were pressed in Jonghong, the capital of Xishuangbanna. 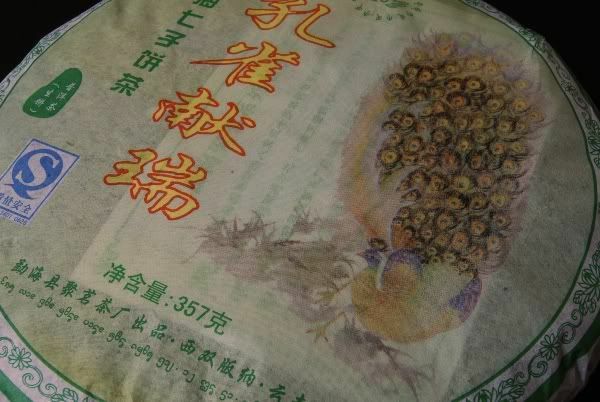 This Guafengzhai is the most limited, being a production of just 84 cakes, whereas the others seem to be in the 400+ numbers. This tea smells amazing. I opened the little foil bag (I bought all of my own samples, conflict-of-interest monitors will be relieved to hear) and was immediately bowled over by an immensely pungent aroma of greenest shengpu. It smells of intense fruits and immediately filled the lounge. As you can see from the image above, the cake consists of medium-sized leaves, which are mostly pressed in large fragments. 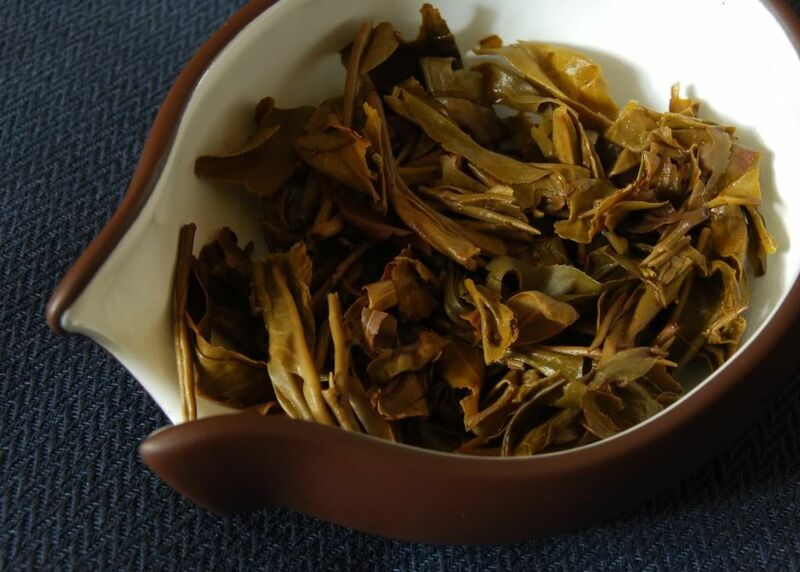 There are few tips, plenty of huangpian [yellow flakes], and quite a few stalks. 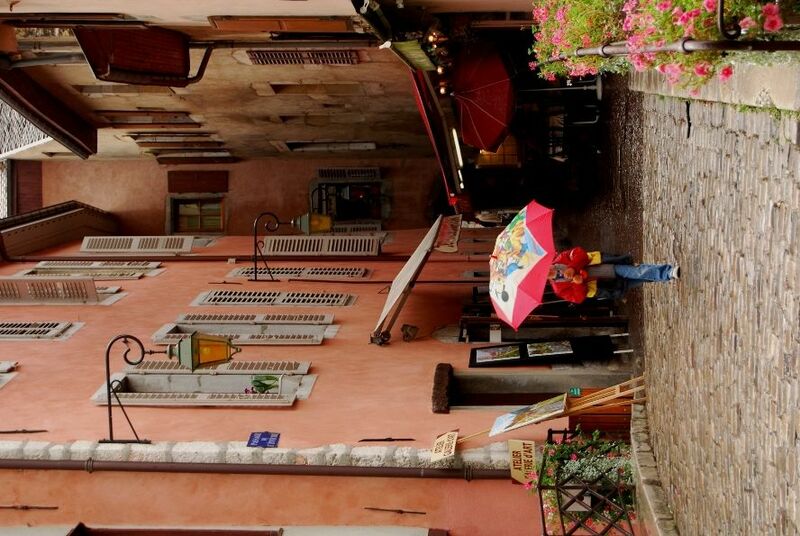 I rather approve of "messy" blends like this, as they can be quite complex. 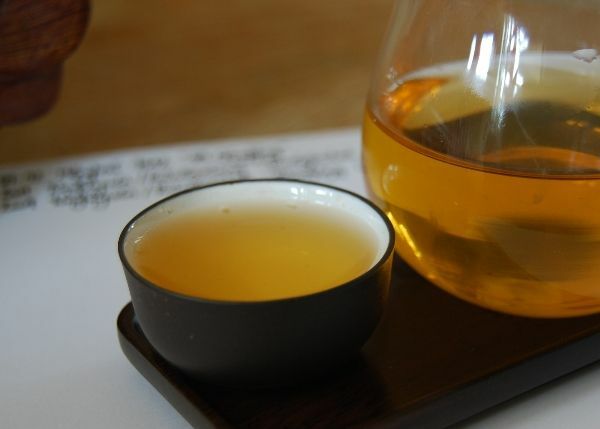 I've been drinking far too many heavy-orange 1-year cakes lately, and so it was refreshing to see that this pu'er brewed a dazzling orange (pictured above). Just like the dry leaves, it has big, bold scents of sweetness that are heavy with buttery sugar. Just like the lovely old-tree Yiwu maocha that I was fortunate enough to receive from Nadacha, this tea is clean, bright, and sweet. It's hard to estimate its future performance, given the immensity of its green character, which should probably have been left for several more months. However, compared to its peers, it gives the impression that it is chock full of complex content, and that can only be a good thing in my book. The entire experience is bold, full, and, happily, it commands the attention. I liked this cake the most of all five, and, while I must confess to buying a cake of each, I did buy two of this Guafengzhai. Like the other Guafengzhai I've had this year, it seems clean, forthright, and filled with charm that I hope will give it plenty of scope for improvement over the years. Apache is unimpressed by the aging of this cake; I have not tried it since 2009. However, the dark leaves have a decently humid and sweet scent, suggestive of some progress being made. The soup is orange where once (see above) it was yellow. 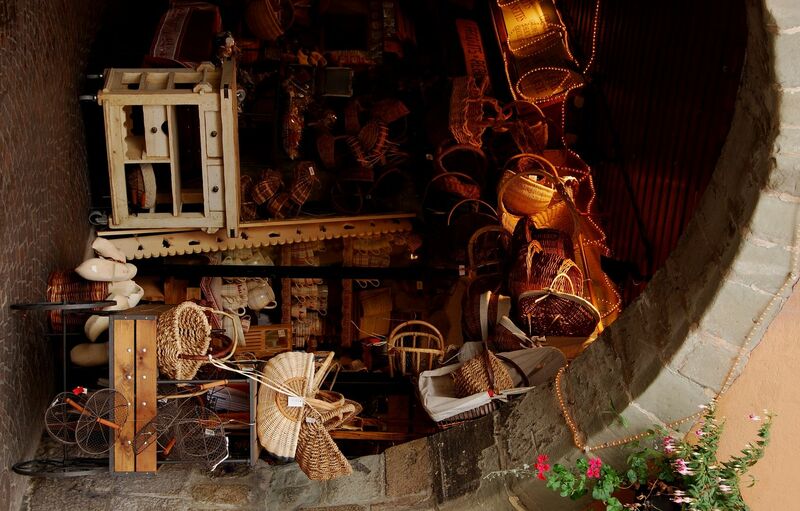 What was once buttery and sweet is now lower, darker, and has the character is humid, sweet straw. It has an obvious cooling sensation, too, which is decidedly good news. All of the upper layers of flavour and fragrance have fallen away, leaving the base. It is this base that has developed with age: it tastes woody, malty, and similar to the base of older cakes. It is not a calming cake, however, and after just four small cups, I feel nervously alert, edgy, and brittle. It reminds me of Apache's 2001 7542. I perspire obviously. The price of this cake has since gone through the roof, but the original is tidy, enjoyable, and aging well. 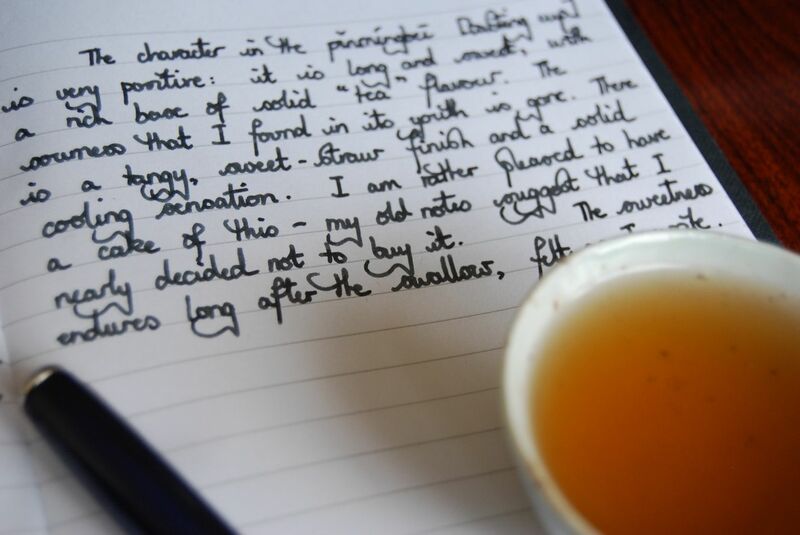 Coming soon: Yunnan Sourcing "alpha" notes. Please drink this tea, if you're taking part in the event. The last of the Meiguohao* from Puerh Shop for this year, I think that it has the one of the prettiest wrappers. That counts for a lot in my book. I'm a shallow man. *edit: except the 905 that was apparently just released while I was writing this. 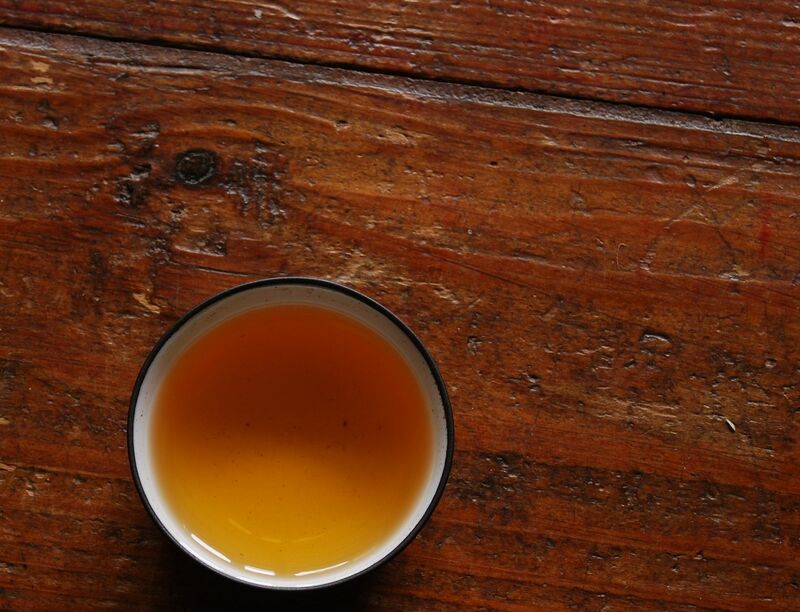 While the 904 was clean and probably the most expensive, the 901 was a chunky Dayi variety, and the 902 started nicely, I don't know what to expect from this tea, which came from Zhanglang area of Menghai. New cakes look so beautiful, particularly when the leaves retain some of their integrity. 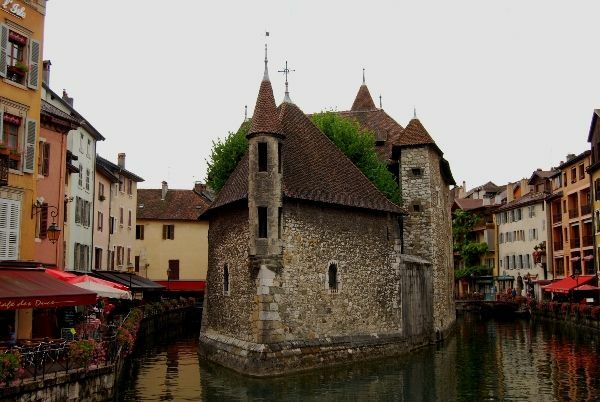 Look at the little beauty below - alluring, non? Lovely folded tips and large leaves... I almost want to take a bite out of it. Big leaves! Dark and green, with a slightly savoury aroma, I remain very hopeful. Bright yellow soup, if a touch thin in colour, this looks decent. The aroma is sweet, but quite distant. 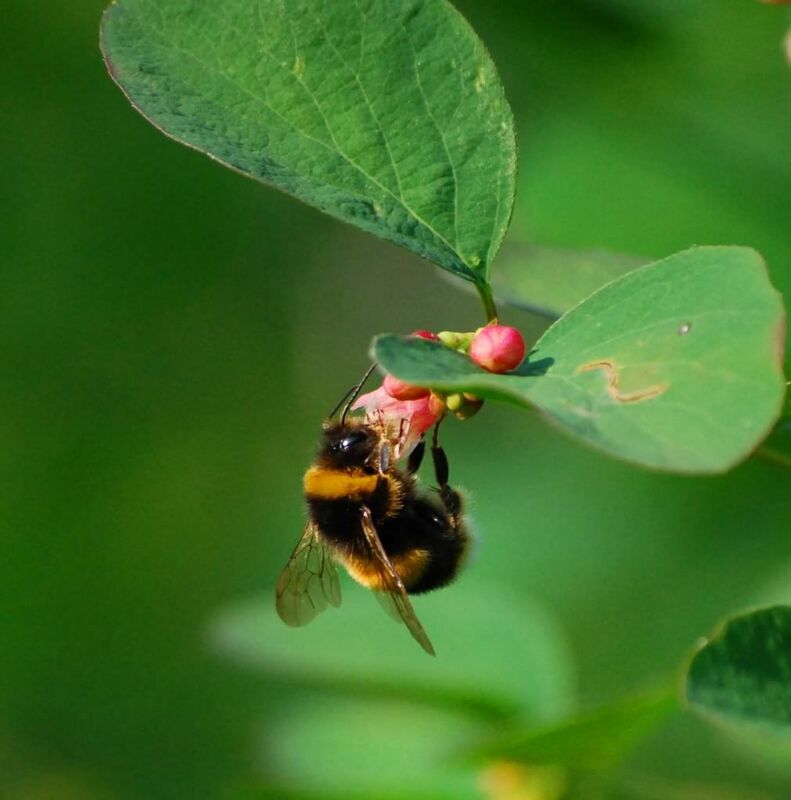 It has a very, very sweet body - high, long, and constant. Eventually, it descends into a solid huigan. The texture is smooth and thin, while its character is green, with some savoury notes. This cake jumps between many genres: sweet, savoury, slightly sour. The leaves are good quality, being sharp and clean, but the blend seems undecided as to what it wants to be. The 903 is sweet and sour with a good huigan. Like the other 2009 Meiguohao, it is clean and enjoyable - at its current price (under $15), it's good value. It didn't captivate me into buying more, but it's very decent, and a considerable improvement on the 2008 cakes. 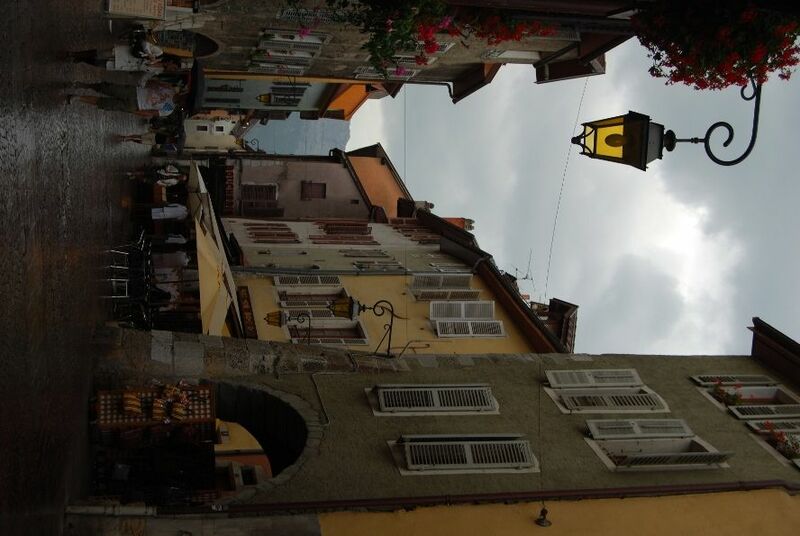 ...because not only can I tolerate the French, but I actually like the French. Don't ask me why. My friends call it an affliction. 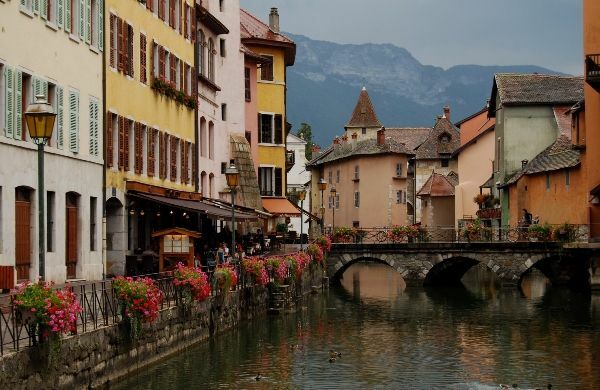 It's just there's something decidedly pleasant about France. 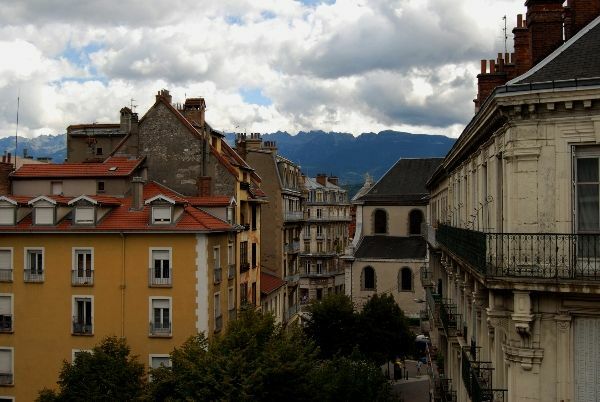 It's all a bit foreign and French, obviously, but I rather like it. In small doses. I don't think my waistline, kidneys, or arteries would really appreciate longer exposure to French culture. Plus my high-school French language ability is a touch out-of-practice, to say the least. 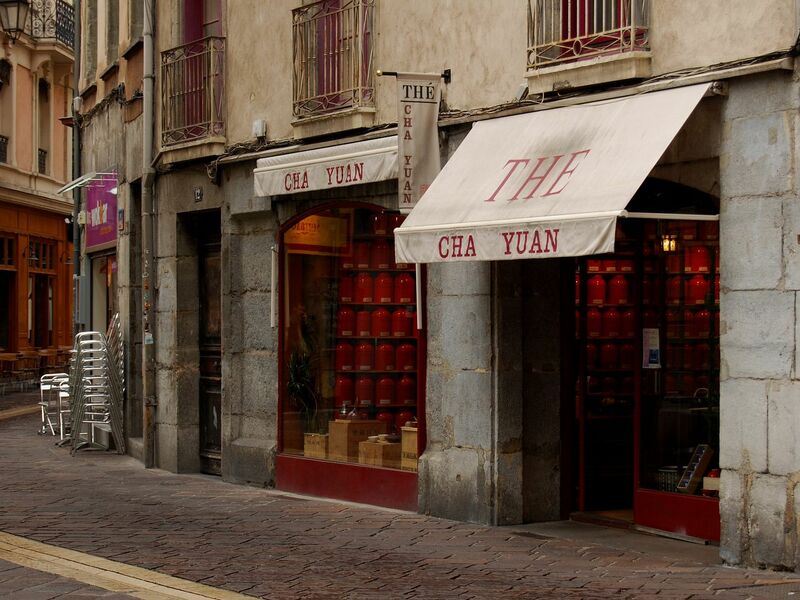 In the middle of charming Grenoble, an old city whose population is over one-third university students and researchers, Cha Yuan [tea garden] is an oasis between cafes and restaurants. It's nice to get away, even on business, but it's even nicer to be home. 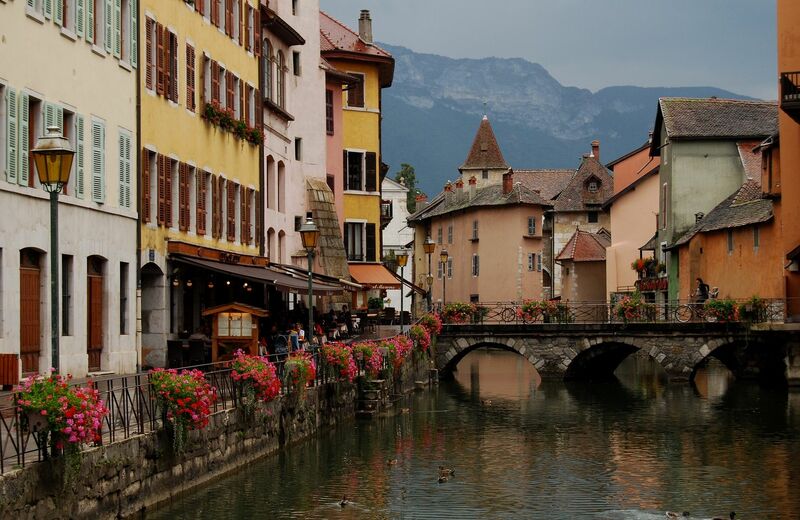 A good journey helps you to understand just how much you love your own home. 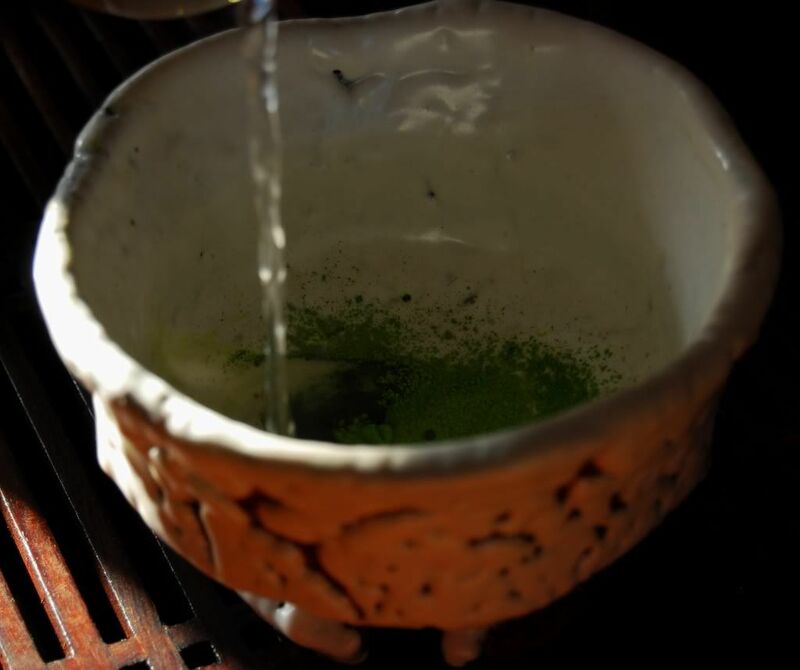 Returning home, sat at my tea-table, it all felt a touch unfamiliar - the feeling of my old teapot, my tetsubin, the pouring of the water. 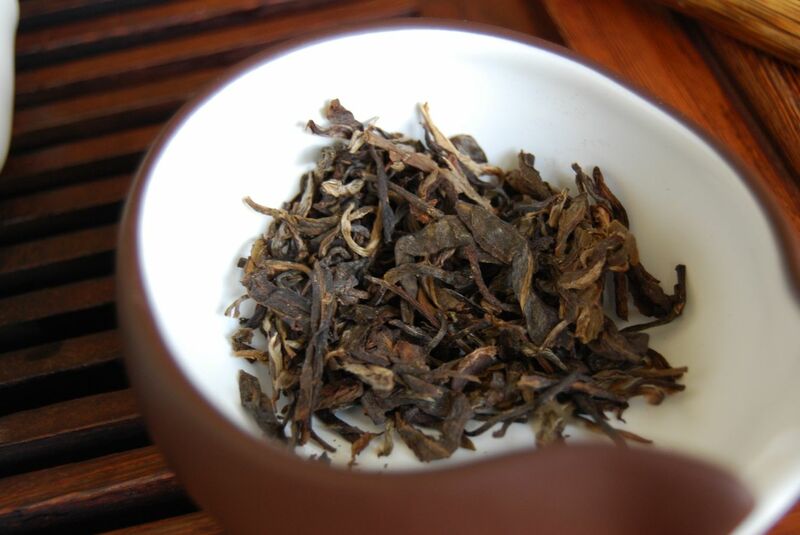 Regarding the Yunnan Sourcing tasting event: I understand that samples are beginning to arrive with people. Please have a crack at them. I'll put some pages up in around a week's time so that we can begin to compare notes. We'll be working through them in alphabetical order (alpha ... epsilon), so you might like to tackle them accordingly. 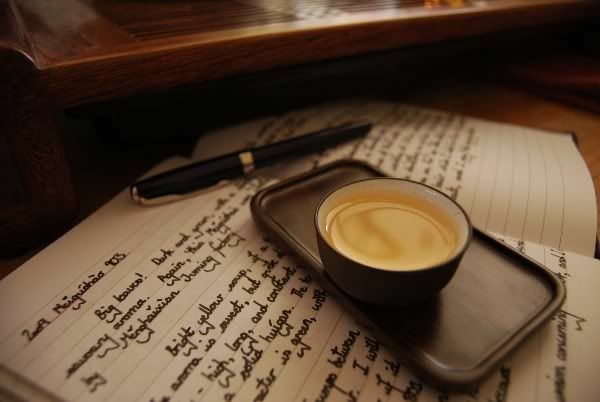 In response to e-mails on the subject: please feel free to write about them if you have a tea-blog; I only ask that you copy your observations into the articles here so that we can collate opinions and start a discussion.